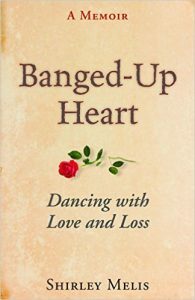 This entry was posted in Book Review and tagged banged-up heart, grieving, love, memoir, romance, Shirley Melis by jerrywaxler. Bookmark the permalink. I wondered about that concern too, Jerry, that you are telling us the end. But I don’t think that will detract from reading the book?certainly not for a writer. You gave away the destination, but not the map or driving instructions. Well done! Jerry, your review took my breath away! In fact, I’m still gasping a little as I re-read your insightful analysis that told me more than I knew and had me wondering whether my memoir would pass muster. Thank you for posting this provocative review on Memoir Revolution and for NOT giving away the explicit ending. I’m experimenting with new styles and content as I try to get my head back into blogging, after a long hiatus, and this “book review-ish” format is enjoyable for me, and hopefully useful and informative to readers. Your and Ian’s feedback leads me to think it “works” – Ian, that’s a bummer about not being able to easily get the book in the UK. I’ll pass the message along – hopefully it will be solvable. Ian, I understand from my publisher, Terra Nova Books, that Banged-Up Heart will be available as an e-book from Amazon in a couple of weeks. Friends in the UK reported same problem — inability to get the book through Amazon UK. When last heard, they were hoping to succeed with Amazon US. Like Jerry, I hope the issue can be easily solved. I regret such acquisition agonies! Thanks for the recommendation. I’m going to check out this book. I still struggle with certain aspects of a memoir I began when I was 21 when a close friend was diagnosed with brain cancer. How to write about death by writing about life is difficult subject matter, at least from the standpoint of structure. I wrestle with it on numerous other projects.